Love capturing most of your precious moments in a digital format? While pictures are great at conveying a visual story at that moment in time, videos also have their place in the entire hierarchy. The Samsung HMX-E10 plays its role well, being a full HD camcorder that is small and portable enough to be slipped into your pocket without much problem at all. This is a point-and-shoot device, boasting a versatile, 270-degree swiveling lens which will enhance your creativity while allowing you to record your very own unique views in each video through various angles. With its swiveling lens, you can also have a new sense of fun when recording video, as it allows you to be part of the video itself without straining your arm too much (or making a guesswork at where the lens is pointed at). All recorded video can be transferred over to a computer using the innovative built-in USB port function, which is a similar to what Cisco’s line of Flip camcorders have. It also frees up your luggage space, since there is no USB cable to bring around. When plugged in via USB, you can also charge the battery, killing two birds with one stone. Not only that, the HMX-E10 will come loaded with Samsung’s play-edit-sharing program known as intelli-studio, where this intuitive program will offer you the ability to edit and play your video from any computer without having to install supporting software. Perfect when you’re traveling and do not have a personal computer or notebook to fiddle with. With an interactive and onscreen “upload” button, the HMX-E10 makes short work of uploading footage to the Web. It drastically reduces the number of steps needed to successfully upload and share video on various sites such as YouTube. Other hardware specifications include a large, high-performance 1/3.2 inch CMOS sensor which can capture video in full HD resolution as well as 8-megapixel stills, a 2.7″ wide touchscreen LCD display, the mentioned swivel lens, and Smart Filters to produce unique lens and color effects. 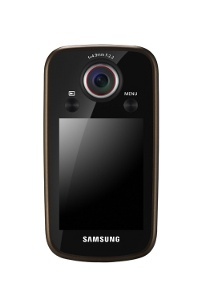 Available in ivory or black colors, the Samsung HMX-E10 will hit the market this September for $199.99 a pop.